Muraki Shingo of Itamae, a top Ginza restaurant, becomes a substitute teacher at Aikawa High School in his hometown of Mie Prefecture at the request of his childhood friend, Kishino Hiroshi, a town hall employee. 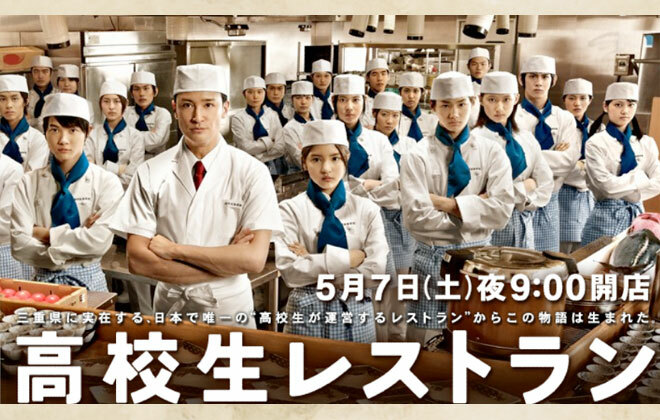 Kishino intends to open a “High School Restaurant” to revitalise the town, and has asked Shingo to teach cooking. There are about 30 people in the culinary club. Among them are Sakamoto Yosuke, a third-year student who is respected by the club’s members and whose family runs a restaurant that sells set menus, and Yonemoto Mai, second-year student who adores him. When Shingo visits the kitchen, the members are making hamburgers and crepes as they please. However, the floor is dirty and ingredients are being used wastefully, as if it were a school festival. Seeing that, Shingo barely offers a greeting as he first points out that Yosuke’s tempura is no good. He also scolds the members harshly. “First, we’ll clean up. Those who find it a turnoff can leave, but in that case, you don’t have to come from tomorrow.” Students start to walk out in the face of Shingo’s attitude, and only 18 remain, including Yosuke and Mai. After the cleaning, Yosuke asks Shingo for the reason why his tempura is not good. Shingo’s answer is a surprise. “You’re left-handed. Get accustomed to using both the kitchen knife and cooking chopsticks with your right hand.” “I don’t know, but that teacher is genuine.” Yosuke reflects and decides to follow Shingo. They are to hold a rehearsal for the opening on one Saturday. The menu that Shingo has set is a grated yam rice bowl using Ise yam, a local specialty. Yosuke is ordered to prepare the stock according to Shingo’s instructions. Then, the day of the rehearsal comes. An incident occurs which causes a definite rift between Shingo and the members!